If your Quiz answers matched 3 stations (or even 2) with the correct city, then go to the Contact page and put your email address on our free distribution list. Washington Union Station, 1977. Photo courtesy of WikiCommons. Architect and City Beautiful planner Daniel Burnham intended DC’s Union Station (completed in 1909) to grandly welcome visitors to the nation’s capitol. As gesture to emphasize welcoming citizens to their government, he intended the right side of this photo as “America’s front yard.” It was to lead passengers directly to their adjacent Congressional campus. Six decades later, Burnham’s vision had been distorted by government’s bias to auto and plane travel and DC’s Union Station was severely neglected as a transportation hub. Owned by the National Park Service, the Station in the above photo failed as the main Visitor Center for the 1976 Bi-Centennial celebration. In this 1977 photo, the “front yard” still had unfinished landscaping. Yet, the station’s lowest point came in 1981 when the roof leaked so badly that the head-house and grand entrance were sealed off from the public as a safety hazard. With ownership transferred to a consortium controlled by the federal DOT as caretaker, this national embarrassment was repurposed by 1988 into a highly profitable shopping mall and it grew into Amtrak’s second largest station. From disaster to success? Not quite. Because the caretaker’s deal to convert the spacious concourse into the retail mall was short-sighted. Passengers lost lots of convenience and the deal did not share profits sufficiently to bring the station to contemporary standards. Today, that aging caretaker cannot break out of its capital-poor condition and redevelop its tracks and platforms to an international standard. Once that is achieved, the mini-city vision above the platforms can become reality. The DC chapter of “What Stations Teach” explains our condition of under-capitalizing train service and proposes a prototype. The Capital Regional Authority could update the platforms/concourse and make an electric through-route to Virginia. It would be a symbol to the nation that these problems, typical of major commuter systems, can be solved by rearranging how regional transportation is governed. This chapter and proposal will be posted in January 2018. Please comment on this synopsis of the forthcoming DC chapter after the 6th answer below. Thanks ! The quiz page’s futuristic rendering will not get built because divided governments in New York’s metropolitan transit makes Penn almost impossible to remake correctly. This people problem has earned Penn more negative opinions and sprouts more visions unfulfilled. Penn’s deeper problem is explored in my 2014 article and this site’s 2018 chapter. Simply put: Penn’s owner has neither authority nor motivation to make the station a 21st Century hub. Worse, the new Penn concourse still will have the old Penn underneath. After six decades of complaining about Penn, it may seem like progress to remove two-thirds of passengers from today’s below-grade dungeon and give them an airy concourse. But the reality is that Moynihan Station quickly will suffer Penn’s core problem: inefficient train systems dump too many people into one terminal. Commuter train travel is more efficient — we have learned from Europe’s five decades of progress — when we convert terminals into through-stations. Through-stations handle far more trains and through-systems distribute passengers widely and more efficiently. Against this widely-held principle, the new Station keeps Penn as a terminal; inherently a design of high-maintenance that breeds low-performance. residents from Connecticut, Long Island and New Jersey by converting Penn to a through-station and using the new Gateway tunnel more efficiently. A longer-term proposal to mitigate Mid-town congestion connects Long Island to New Jersey by converting Brooklyn’s Atlantic Terminal and building a new through-station under Fulton in lower Manhattan. Regretfully, these proposals to update bankrupt mid-Century terminals into the 21st Century are as distant a pipe-dream as Penn’s futuristic rendering on the quiz page. To illustrate how badly agencies grasp the future, diagrammed above is a proposal made in 2008 by the Regional Rail Working Group, a consortium of transit groups coordinated by an independent institute and, essentially, doing the public’s work for free. Ten years later, the RRWG proposal to connect Penn and Grand Central has gotten almost no political momentum. Instead of mapping an efficient future, agencies are preoccupied by the transit crises caused by their neglect. Yet, this simple through-system solution is the best strategic public investment to prevent today’s crisis of capacity from recurring elsewhere in the network. politicians’ grand futuristic visions for Penn Station with solutions that work elsewhere and can be executed here by authorities capable of fulfilling rail’s potential to reduce regional congestion. Please comment on this synopsis of the forthcoming NY chapter after the 6th answer below. Thanks ! This photo from the City’s official 2012 Union Station Plan acknowledges the most persistent problem of the nation’s third busiest station: too many passengers at peak hour caused by six commuter lines terminating here. concourse and squeeze themselves out to crowded streets and bridges. A very high percent walk because of poor connections. No way to welcome — or thank — taxpayers and employees for a good day’s work. A broken hub in the “City that works”, CUS is a festering dysfunction that has defied remedies of existing agencies for three decades. America’s second worst station finally has a good chance of improving. (My previous study rated CUS at 62 and Manhattan’s Penn at 60. Note that Amtrak owns both.) Four factors make improving CUS more possible. First, Chicago’s Mayor is ambitious for transit for the first time since, probably, the 1940s. Fourth, Chicago has an effective civic community that made CUS a regional priority. But, our government makes two major counter-weights to progress. First, the Mayor (who used to run the White House) is not friendly with the new folks in The White House or Congress. Second, Illinois’ hyper-dysfunction directly undermines the state agency controlling 90% of CUS’ trains and makes improbable the higher rent needed to pay for better station platforms and concourse. In obvious and subtle ways, Illinois’ control creates a condition for CUS that the region must remedy. Until Chicagoland strikes a new transit deal with Illinois, the Mayor is limited to putting the real estate deal on a fast-track and improving the station superficially. He only can hope the next mayor agitates to reorganize the rails and platforms so they are efficient. But, such hope is highly improbable given that even today’s effective “transit” Mayor has multiple fiscal fights with Illinois over other public services; many the result of Illinois’ constitution being biased against Chicago. What CUS, Chicago, the system and Chicagoland needs is a through-route so trains help redevelop sub-regional centers. Yet state indifference has caused sensible plans to gather dust. For example, feasibility studies have not advanced to use an existing track corridor to connect the main airport to downtown’s two central stations and, then, through to the convention center. Yet, a broken state also opens Chicagoland’s opportunity to cut its deal to control its transit future. Thus, this WST chapter proposes creating a new metropolitan authority — elected by taxpayers — to sort through the morass left by Illinois’ indifference. TRIB — the Taxpayers Regional Investment Board — has the entrepreneurial authority to stimulate redevelopment of regional centers, negotiate Value Capture deals, initiate 3Ps, update trains and replace agencies when they don’t give taxpayers value or passengers better service. This article will be posted in late 2018 to coincide with political developments. Please comment on this synopsis of the forthcoming Chicagoland chapter after the 6th answer below. Thanks ! First, LAUS and its surroundings sprawl east, north and west. On the south (the photo’s bottom), LAUS tracks terminate at U.S.101 and this highway also isolates the transit center from the edge of downtown. Separation and sprawl combined has resisted two decades of efforts to give LAUS a mixed-use urban feel. The current Plan intends to overcome that resistance and make LAUS into a destination. Yet, that Plan effectively must jump the highway and make the destination a desirable urban place for pedestrians. Second point: an Edifice Complex (a fancy station) changes transportation marginally. Appearing as the tan tower on the far right, the Headquarters of LACMTA (the LA County Metropolitan Transportation Authority) gives the impression of being lord of the realm. LACMTA owns LAUS, is branded as Metro which operates the nation’s second largest bus system, the largest light rail fleet, the eighth largest subway. LACTMA is the major partner in the tenth largest commuter rail called MetroLink. LACTMA also plans and provides highway funding. Furthermore, this amassed authority also gives LAUS the best chance of being America’s second through-route. However those estimates doubled two years ago when, mysteriously, the tracks and platforms had to be raised four feet. My theory — so far not disputed — is the additional four feet of clearance was needed to allow trucks to continue using 101 in a section that borders LA’s downtown and is among the nation’s most congested. A proper authority, instead, would have re-routed the trucks and advanced regional rail. Instead, train through-routing is enormously more expensive, time-consuming and difficult. LACTMA’s indecisive authority perpetuates unbalanced transportation; an expensive lesson restraining regional rail here and nationwide. The LAUS through-route is a metaphor for how even one of the better transit agencies has insufficient power to do the right things economically. Remedies are proposed in the “WST” chapter including how to change Metrolink’s relative flat-lined passenger growth. The chapter ferrets further how LAUS could evolve more economically. Playing out the station-as-metaphor, the chapter explores southern California’s Edifice Complex; starting with LACTMA’s HQ, then the dazzling drawings for LAUS and, finally, the fantasy station actually built to serve Disneyland. This chapter suggests how the LA region can evolve beyond the Edifice Complex, make good looks into effective transit and construct a new deal that offers commuters genuine alternatives to the car. Please comment on this synopsis of the forthcoming LA chapter after the 6th answer below. Thanks ! This DenverInfill photo from mid-2016 is a largely completed transformation that many cities could follow. Running up the center is DUS with its platforms, roads and elegant, open train shed. Link to this DenverInfill post to see this angle four years earlier. Back then, the right side was a rail-yard-in-transition with almost no buildings. Today, it is a mixed-use community. Most of the left side — an unloved warehouse district in the 1990s— is redeveloped into a vibrant, mixed-use community. DUS offers perhaps the best solution to the common problem of western stations being isolated from their central business district. One big step further, the success of DUS and its RTD (Regional Transportation District) promise to make Denver the most likely model to provide an alternative to the Sunbelt’s car dependency. Behind Denver’s achievements are two innovations that employ the private sector’s economic advantages. First, the RTD managed well a private sector master developer who transformed DUS and its rail yard. This synergy accelerated repurposing the tougher pieces of the historic warehouse district and, thereby, integrated downtown with its previously isolated central station. For the second innovation, RTD’s FastTrack commuter rail lines (Eagle P3) was completed reasonably on-time and close to budget. Relative to huge cost-overruns nationwide, Eagle P3 offers an alternative model to restart and, we expect, operate commuter rail. What lead to these innovations? The key factor is the RTD’s elected Board. Accountability at the top improves transit’s two future strategic relationships: taxpayers and private partners. RTD helps taxpayers believe they are getting value for their money. Sales tax increases over the last two decades paid for Denver’s light rail network and taxpayers seem to think they got value. While commuter rail is too early to judge, it impresses. It also is too soon to judge if agencies negotiated good, long-term Value Capture and TIF deals to redevelop the rail yards and warehouses. But, the redevelopment is impressive and early signs indicate it will provide a good tax base to support transit. How RTD developed relations with the private sector is clear in FastTracks’ commuter rail Eagle P3. PPPs had an unknown track record for trains. But, the RTD’s Board was in a bind after the 2009 financial crisis. Build-out was projected to be 52% above available capital. RTD’s Board could have done what appointed boards do: ask taxpayers for more sales tax. But since it would have been a mere 5 years since FasTracks promised to deliver trains using the previous increase, this elected Board put themselves in the position of taxpayers. This accountability was a major factor in the Board risking a PPP. Quickly and by mid-2010, the Eagle P3 shaped America’s first train DBFOM (Design-Build-Finance-Operate-Maintain.) This full service partnership probably set American transit’s speed record for build-out and, equally important, leveraged public money by raising 25% of the capital as private bonds. Instead of the tendency for appointed Boards to approve sweet contracts to vendors usually well-connected to the Governor or mayors, RTD’s elected Board got truly competitive proposals and selected the firm most qualified to get the job done economically. All these compliments said, DUS still has two flaws discussed in this chapter. But in general, an elected Board engenders more confidence with taxpayers and private partners. This is the primary theme of our forthcoming chapter due to post in early 2018. Please comment below on this synopsis of the forthcoming Denver metro chapter after the 6th answer. Thanks ! If Denver is a success story at connecting its downtown to its central station, then San Francisco is a quantum leap. In a decade, the Transbay Transit Center (TTC) prompted a second downtown; including the second tallest skyscraper west of Chicago and two mixed-use neighborhoods of over 6,000 residential units, mostly in high-rises. For context, SF put together the largest real estate deals around a train station in the 100 years since Grand Central Terminal’s mini-city was built. But regarding overall policy for transportation, SF is only a half-leap. Solving why downtown SF still does not have commuter trains from San Jose — despite this being a priority for most of this 21st Century — will give us important clues on how to structure commuter rail in the future. TTC’s rooftop park and bus terminal will be completed by late 2017 (the elevated bus ramp is on the right in the above photo-shop.) This success for buses contrasts starkly with the failure of the Transbay Joint Powers Authority (TJPA) to complete the tunnel and underground concourse so trains can bring commuters downtown. Desperate for funding to keep hopes alive for the train station, TJPA sold station naming rights to the neighboring Salesforce Tower. 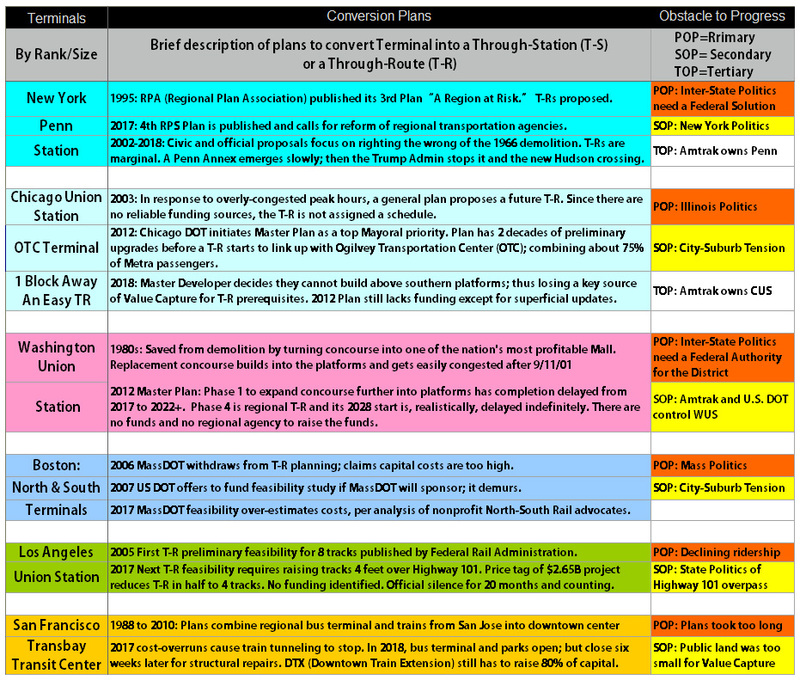 But, the TJPA still has no believable plan to finance the completion of the train station. Worse, Value Capture (VC) deals are being whittled away by property owners who say they were sold a train station and did not get one. They have a point; and the law is on their side. Major changes are required before downtown SF gets train service. Relative to out-dated laws and agencies, VC was over-sold as supplement to the TCC’s rising costs. For context, VC’s only success story is Manhattan’s subway extension to Hudson Yards. Then, major variables were controlled (all land was owned by the state, subways have simpler politics than rails, etc.) While also being valuable land, the TCC’s variables are far less controlled. Learning these lessons can help us evolve VC so it can support advanced transit in less controlled situations. These two chapters show us how. Finishing the station is beyond the scope of outdated agencies who, largely speaking, were empowered by County Boards to make appointments to joint authorities to run failed private rails. To overhaul governance to achieve better train travel, “WST” develops this argument that basically says: if you want to tax property owners based on increased value created by transit, then different agencies and laws must make that deal work. Running through both chapters is this theme: if you want to explore private participation in transit, you had better create a new agency that has proper authority and is easy to work with and is more accountable for public assets. Despite SF updating its agencies better than any major city, SF authorities cannot construct a new deal that extracts revenue from landowners who clearly benefit from the TTC but, now, do not have to pay their fair share. The first chapter proposes this deal by remaking SF and sub-regional powers to replace the current Joint Powers regime. This proposal is within the context of California continuing to decentralize its authority. These new powers to finish TTC should serve as prototype to help redevelop San Jose Diridon Station and its proposed Google campus. The second chapter syncs the regional priority of trains entering the TTC with a regional deal for a regional transportation policy; again by devolving California authorities. This proposal is a prototype to evolve the Bay Area’s Metropolitan Transportation Commission into a comprehensive — and hopefully elected —regional authority. These two chapters will be released in Spring 2018. Until then, please comment, make research suggestions and, above all, offer to critique pre-publication drafts. Thanks ! Please comment below on this synopsis of the forthcoming SF Bay chapters or any of the other 5 previous overviews. Thanks ! After posting these 3 Parts, this blog will evolve and help serve as a forum to detail a federal policy to promote regional rail. For Free, Follow "What Stations Teach" via Email. I consider Jarrett Walker one of the great explainers of transit while stirring controversy. I started Jeff Wood’s two week free trial subscription and can’t live without it. What Stations Teach Blog at WordPress.com.